Below quite a few readers have shared their reviews of LA's Totally Awesome cleaner, and stories of how they were first introduced to this product. I had a horrible problem with tree sap on the exterior of my car. I had tried every car cleaner available and nothing worked. I took my car to the car wash and the attendant said I needed to try L.A.'s Totally Awesome cleaner. I had never heard of it but he swore by it. He sent me across the street to the Family Dollar store where I bought a large bottle for just $1.00. I was skeptical because I had already spent so much money on other cleaners and nothing worked. I took it back over to the car wash and the attendant helped me and sure enough the sap came right off. Then he told me that it was all he ever used on his car, his boat and around his house. I went home and tried it for myself on my appliances and couldn't believe how quickly it cleaned off dried food and everyday dirt. I then tried it on my counter tops and from there put it on just about every surface in my house. Now I use it exclusively to clean my counter tops, toilets, refrigerator, stove tops, showers, car (exterior), and my tile floor. on just about any place that needs cleaning. I have recommended the product to several of my friends and they have all thanked me for the suggestion. It is so affordable and easy to use and it's my only choice when it comes to cleaning my house or car. 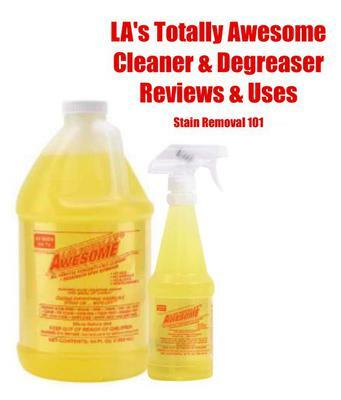 Thanks Violet for sharing your review of LA's Totally Awesome all purpose cleaner. I think it especially cool that you found a way to remove tree sap with it. If other people have tips for removing tree sap from various surfaces, I would love to hear them too! You can share your sap stain removal tips here, or read other tips and tricks already submitted. In addition, this product is advertised to be safe for lots of surfaces, and to be used as both a cleaner and stain remover, including for clothing. I would love to hear from even more people who have used this product, on any variety of surfaces and fabrics, to share how it has worked for them, good or bad. You can share your general purpose cleaner review here, for this or any other product, sharing how you use it in your home, and why you like (or dislike) it. In addition, as a side note, I have some links above for ways to purchase this product on Amazon. However, I would suggest to people that if they can find it at their local dollar stores, where this product is mainly found in stores, I would definitely buy it there instead. The reason is that at dollar stores this product is a MUCH better deal, especially with shipping, etc. Join in and write your own page! It's easy to do. How? Simply click here to return to cleaner degreaser. Can You Use Totally Awesome To Wash Rugs? Can you use this product to wash rugs in a washer? I did some research about this product on the manufacturer's website, and my answer is yes, with a caveat. The product is designed both for use to cleaning surfaces in your home as well as to be used in the laundry. The website claims the product is safe to be used for stain removal and as a presoak for fabrics. To the extent that yes, most fabrics can be washed with this product, yes you can wash rugs with it too. The thing is, you've got to be careful in general, no matter what product you use, when you wash rugs in the washing machine. Some of them are quite sturdy and also colorfast and will do just fine. Others are quite flimsy and will basically disintegrate with a heavy washing, or will bleed dye everywhere. Further, it depends what fibers your rug is made from. If it is wool, for example, you need to be much more careful in what you use to wash it than if it's a cheap cotton blend. For delicate fibers I suggest using a delicate wash products. I hope this answer has helped you! I've answered this question as part of the laundry questions section of the site. Pop on over and see what else I've answered, or ask me your own question. 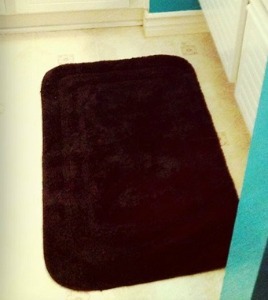 Plus, if anyone else has suggestions for products you like to use for washing rugs I would love to hear them. You can share your tips here and I'll add them to the site! LA's Totally Awesome Degreaser Is Best For Mechanics! Marnie shared the following quick comment on the site's Facebook page when we were discussing the removal of lipstick stains, since another reader had shared how she removed lipstick stains with this product, along with ammonia. I've always used that degreasing soap for mechanics clothes. It takes out anything oil based, even diesel fuel! It works great and the first time. Thanks for the tip! It is always nice to know another alternative to using Lestoil to remove mechanical grease from clothing. I checked on the product's website and this is both an all purpose cleaner and degreaser, and is safe for both household cleaning as well as for laundry. It comes in a concentrated formula, so follow instructions for proper dilution depending on the task you are accomplishing with it. Do you have any tips for removing grease stains? If so, click on the link and share them with me here, or read the others that have already been submitted. Further, check out even more reviews of laundry stain removers here if you're looking for a new product to try. Comments for LA's Totally Awesome Degreaser Is Best For Mechanics! 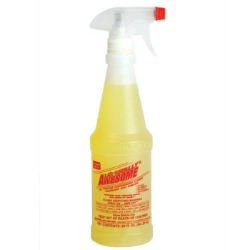 The Dollar Tree has a product called "Awesome" it is the base of a lot of different cleaners and it is just that AWESOME. My son spilled juice all down the front of a brand new shirt and I thought it was a goner. My friend gave me a bottle of Awesome and I soaked it for 48 hours. The stain was gone, the color was in a little pool at the bottom of the bowl. I've used it ever since with great results. This also works very well when you have bed bugs. A good friend told me tried to see if would work it really helped him because he own rentals. People he has staying within his rentals they have had them. I was looking for something to spray some wasps with. I found my awesome and sprayed them with it. They dropped dead shortly after I sprayed them. I am a faithful user of Awesome,best all purpose cleaner ever, great on laundry. I use it for my grandson's baseball uniform. He's got the whitest uniform they ask how I get it so clean. I of course tell them Awesome. It removes grass stains and the red clay from the field. However, I noticed recently it's not the same. I don't choke with the spray anymore and it's not cleaning as well. I don't mind the choking. I'd rather have the old Awesome back, I can handle the choking it's worth it. Please bring back the original Awesome. Great product for car interior. It took out 90% of the stains in my car. The only thing is it did leave marks on the car interior ceiling as I only spot treated stains. If I would have saturated the entire hung then this wouldn't have happened. Also, I would suggest wearing gloves as it dried out my hands pretty bad. I used it to get blood off my mattress. Then I had a white shirt with barbecue sauce. It all came out. I love this. Fabulous. Used it in my carpet steam cleaner and it worked much better than any carpet cleaner used to date. My carpet was a mess, despite constant cleaning. It now looks almost brand new. I totally lucked out because I was out of carpet shampoo and I just bought this product in the 64 oz size and it said it was safe on carpets, so I gave it a try. ***** (5) stars and I am a tough, tough critic. I have tried all kinds of cleaners both homemade and commercial. This cleaner works wonders! I have a black shower and it cleaned it to a shine. Hi to everyone that are grateful for the things that they have and work so hard to get but nature can bring on some hard situations like a house fire. A month ago a friend of mine house's burned down. Everything had smoke damage and soot but a lot was saved and restored because of the totally awesome cleaner. The company don't know what they really have in that little yellow bottle but it can really save your precious memories and money for $1.00 a bottle at your local dollar store. Try it and you will be amazed and everything in your home will be awesome. I spot cleaned dozens of dog stains that were in my carpets and went behind with dry clean rag afterward. My male husky may not make it. He either ingested some thru his pads and paws and then licked himself of he licked where I had used on the carpet, It has been touch and go. I don't care about the money at vet's-I just want him to get healthy again, at any cost. That is how much I love this boy. His mouth, throat and esophagus are full of ulcerations and very painful for him to swallow. The only thing I can get him to eat is peanut butter for days now. But his first symptom was the white of both his blue eyes turned red about 3 days after I did the cleaning and AWESOME CLEANER being the cause never entered my mind. Vet game me eye drops but then all the other things started happening so we went back for blood work and a fluid IV. If you are a praying person, please say a prayer for my beautiful blue eyed red coated rescued dog. Thank you and just please everyone be careful. It wouldn't take the red stains in my truck off the carpet. If it was more than a dollar, I'd be pissed. Can LA Awesome be used to clean grease off bluestone stoop? A friend told me that she heard that this product can remove acrylic paint from clothing, like jeans (which is what I'd like to do). Does anyone know for sure? Thanks! I have used this product on a variety of laundry stains and have never had one not come out in the wash. Very impressed! Just wondering, does anybody know if this stuff works on wood to remove burns? My husband is terrible and keeps putting burn marks on our wood table. Thanks. Has anyone had breathing problems after using this product? I bought this product back in June love it tried it today on my stain on my carpet that I have tried for 2 years to get ride of and I finally got it gone with Awesome Cleaner I'm so happy. This product is excellent on vinyl siding. Spray, soak 10 minutes, rinse, and it's like new again!! Awesome works great on mold on siding too. All I did was spray it on, wait until it turned yellow, and sprayed it off with a garden hose. No scrubbing or anything. Is it safe for oven use?? I have used the Awesome cleaner in my kitchen and bathroom and loved it and I was really excited to read some reviews that some people had used on their carpet, in their carpet cleaner. Our carpet is in pretty sad shape and really needs a deep cleaning. One dog had a short illness and our other sweet boy went downhill and had some trouble with his bladder and some bleeding as he was near the end. So I was planning to try it but then I saw the post by Linda B. that her dog is so, so sick from the cleaner it seems. Does anyone else have any feedback about use of it with pets? I have used it for a few years now since I saw it at Dollar Tree stores. I always knew it works on grease spots in the kitchen but recently discovered it works on grout stains too. Awesome cleaner has saved me a lot in the cost of having to replace artist (and house painters) brushes. No matter if solid-dry, oil or acrylic, soaking overnight or a couple of nights will soften the paint to a point where it can be completely removed! It does not adversely affect either bristle, taklon (nylon),sable or other fiber, your formerly spatula, like brushes regain their pliant qualities with no damage! My husband used it on our gutters and soffet this weekend. It is so white now it shines. Also we were having problems with hard water from our sprinkler system turning our house siding rusty. Just sprayed it on and the rust is gone! Directions: Dilute before use. Start with the recommended dilution, but you may find it necessary to use more or less cleaner to adjust for varying cleaning problems or hard and soft water conditions. For use in carpet cleaning machines. Do not use concentrated on glass. For 10 to 1, use 10 cups of water to 1 cup of Awesome. For 5 to 1, use 5 cups of water to 1 cup of Awesome. For 2 to 1, use 2 cups of water to 1 cup of Awesome. For 20 to 1, use 20 cups of water to 1 cup of Awesome. For 30 to 1, use 30 cups of water to 1 cup of Awesome. For 50 to 1, use 50 cups of water to 1 cup of Awesome. For 120 to 1, use 120 cups of water to 1 cup of Awesome. Dilution Scale: Air Conditioners - Water 10 to 1 Awesome; Aircraft - Water 10 to 1 Awesome; Auto Engine - Straight; Auto Floor Mats - 5 Water to 1 Awesome; White Sidewalls - 2 Water to 1 Awesome; Bathroom: Shower - 5 Water to 1 Awesome; Sink - 5 Water to 1 Awesome; Tub - 10 Water to 1 Awesome; Blackboards - 20 Water to 1 Awesome; Blanket Wash - 5 Water to 1 Awesome; Car Wash - 50 Water to 1 Awesome; Chrome - 10 Water to 1 Awesome; Cloth Furniture - 10 Water to 1 Awesome; Conveyer Belts - 10 Water to 1 Awesome; Doors - 5 Water to 1 Awesome; Driveways: Light Oil - 10 Water to 1 Awesome; Heavy Oil - 5 Water to 1 Awesome; Fibreglass - 10 Water to 1 Awesome; Floor Cleaning - 10 Water to 1 Awesome; General Cleaning - 10 Water to 1 Awesome; Heavy Oiled Surface - 5 Water to 1 Awesome; Ink - Straight; Kitchen Stove - 5 Water to 1 Awesome; Kitchen Stove Hood - Straight; Marble - 10 Water to 1 Awesome; Naugahyde - 10 Water to 1 Awesome; Nicotine Buildup - Straight; Office Machines - 10 Water to 1 Awesome; Paint Oxidation - 5 Water to 1 Awesome; Plastic - 10 Water to 1 Awesome; Rugs: Shampoo - 30 Water to 1 Awesome; Spotting 2 Water to 1 Awesome; Rust Stains - 2 Water to 2 Awesome; Smoke Damage - 2 Water to 1 Awesome; Steam Cleaning - 50 Water to 1 Awesome; Tile Grout - 5 Water to 1 Awesome; Venetian Blinds - 5 Water to 1 Awesome; Vinyl Furniture - 10 Water to 1 Awesome; Vomit Remover - 5 Water to 1 Awesome; Wax Stripping - 5 Water to 1 Awesome; Windows - 120 Water to 1 Awesome; Wood Furniture - 10 Water to 1 Awesome; Woodwork - 10 Water to 1 Awesome. Awesome is great for killing insects, ants, spiders ,etc. But, when I sprayed on ants in my laundry room, and let dry, it stained the tile. Nothing I have tried will take out the stain. Any suggestions? Do you need to dilute the spray bottle version? I use awesome when I'm cleaning my client's kitchen and bathroom. It can do some wonders at first I use to hate using it because of the strong smell but if the smell change lol but please don't use it full on strength it can take the paint off some stuff. Also I use it in my clothes especially under the arm part of my clothes get deodorant stains out of black clothing well any color clothing. You can find it at any local dollar store it's really worth it. How much do I use to get stains out of laundry? I don’t have anything but laundry right now. Please & Thank You!!! I applied this worthless product on my laundry, let it sit for 45 minutes, washed cloths as usual, it removed zero stains. Don't waste your time or dollar. Can this be used to clean you oven? They also have a powdered blend that you add to the washer which is chlorine free. You can't find it in a Dollar Tree around you. What happens if you accidentally spray some on your food and ingest it. Anytime any type of cleaning product is accidentally ingested you need to call Poison Control and ask them what you should do. It's important! If you haven't called yet, do so immediately! aromas and scents as most leading brands. The LA All Purpose Cleaner, cleans everything! If they can add great smelling fragrances to their products... OMG!